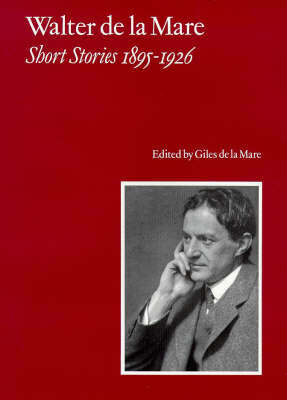 The publication of "Short Stories 1895-1926" celebrates the fiftieth anniversary of Walter de la Mare's death. It is also the culmination of a major literary enterprise. For many people Walter de la Mare (1873-1956) is as great a writer of fiction as of poetry. But the majority of his short stories, of which there are a hundred, have long been unavailable. "Short Stories" brings them all together in three volumes in the first comprehensive collection to be published. De la Mare's earliest published works were stories, and he continued writing and rewriting stories throughout the rest of his life. There was always a creative counterpoint between the themes and imagery of his prose and his poetry - such as the dream, childhood, the house, night, love lost and regained, solitude and the traveller. A full understanding of either is impossible without knowledge of both. Walter de la Mare (1873-1956) was one of the leading poets and novelists of the twentieth century. His writings are known throughout the world, and have been translated into numerous languages. He wrote poetry and fiction for both adults and children. He is loved and admired equally by the young and the old. Together with the Complete Poems, published in 1969 and shortly to be brought back into print -- and also edited by Giles de la Mare -- Short Stories I, II and III provide the definitive text of Walter de la Mare's creative writings. De la Mare was in addition an anthologist of genius and an outstanding literary critic, serving as the main critic on the TLS for many years.